She also gained a sound knowledge of ceramic chemistry and experimented with applying stoneware glazes on unfired red clay creating the first of her volcanic jars with deeply fissured and pitted sides. 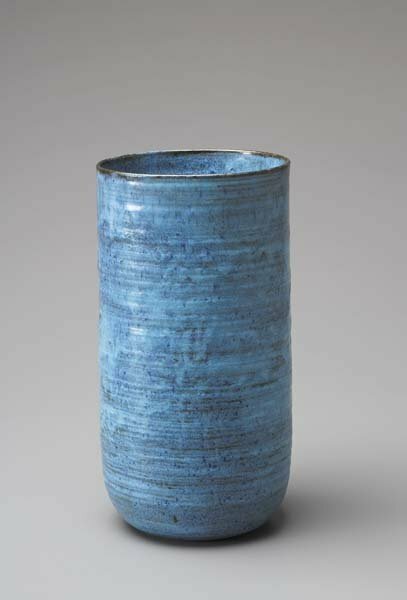 An ancient technique, raw glazing became a signature feature of her work. Whether decorative or functional, she always thought of her work to integrate with the domestic interior. With Hoffman’s help, she held her first exhibition in 1923 at Hoffman’s Palais Stoclet in Brussels. And two years later participated in the Exposition Universelle in Paris. In 1926, she married Hans Rie (1901-1985), an easy-going young businessman who worked in the Bruder Bohm hat factory. 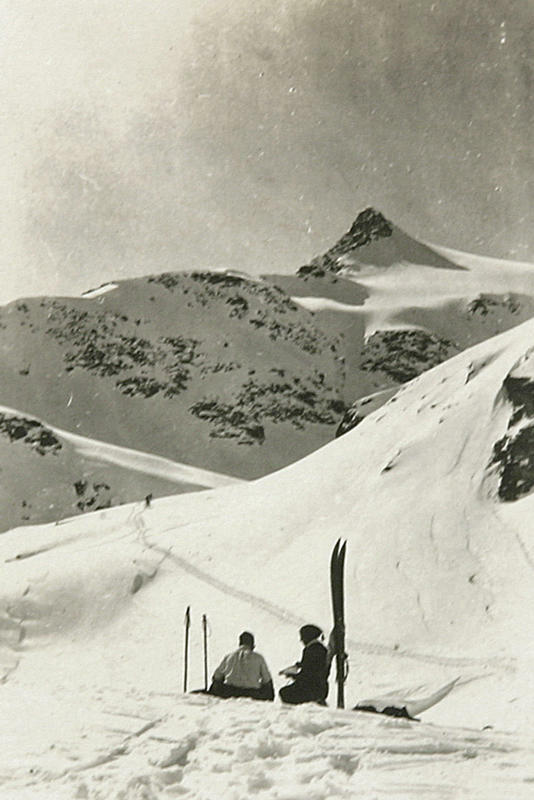 They had little in common except for a fondness for skiing. Rie turned to her work. Over the next decade she further developed and honed her style, but with the union of Austria with the Nazi Germany, she and her husband escaped to London in 1938. Her husband left for America and in 1940, they amicably divorced. 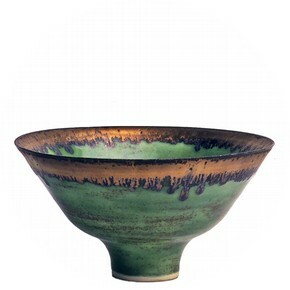 Her popularity had not caught on in London where the work of Bernard Leach dominated. Leach tried to influence her with his heavier oriental meats Arts + Crafts aesthetic. He thought her pots were too thin and her turning too fussy. but her own work remained severe and urban. Rie rooted her works and ideas in the Modern Movement. Still, they remained life-long friends. 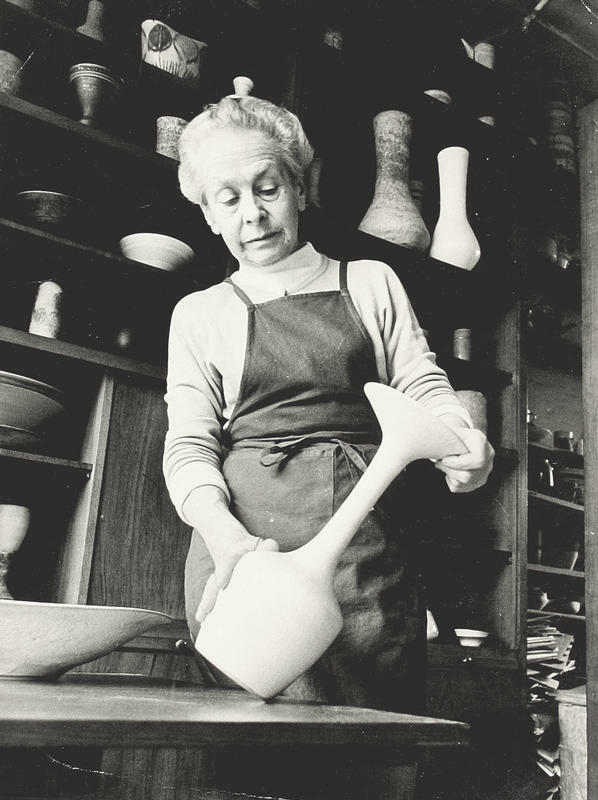 ‘I am a potter, but he was an artist’ Lucie Rie said while being interviewed by The Guardian in 1988. Her work nearly halted during the war. She hired assistants to make colorfully glazed ceramic buttons and jewelry. One assistant named Hans Coper, a young German refugee, was hired in 1946 to help make the buttons. Hans Coper trained as her assistant and together they created an enormous range of tableware and on off pieces. 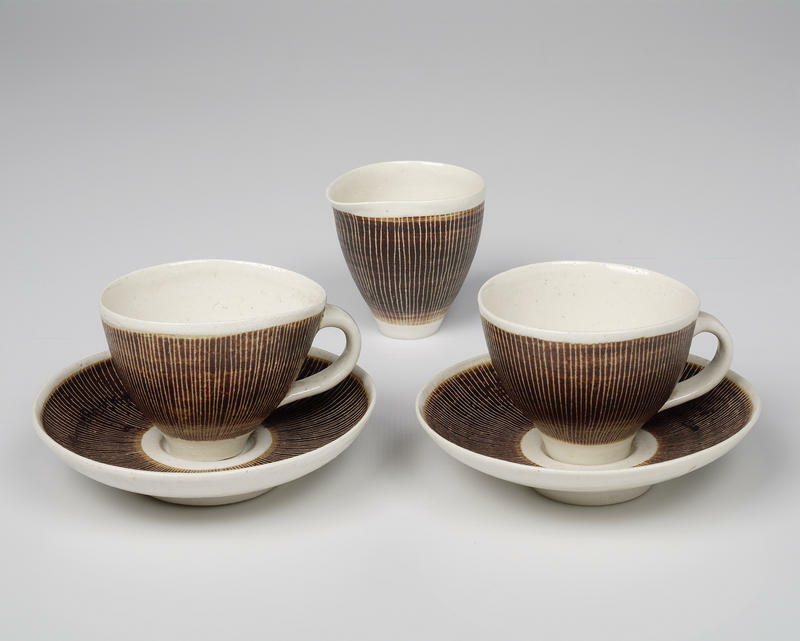 Four years later they began to share a series of exhibitions and supply Heal’s department store with tableware. 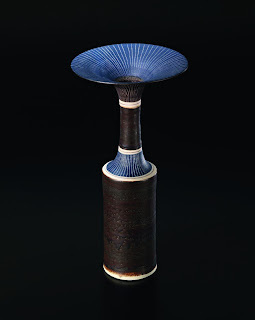 Rie’s and Coper’s personal styles started to diverge: hers remained functional, his became sculptural. Eventually, in 1958, Coper decided to set up his own studio and teach extensively. 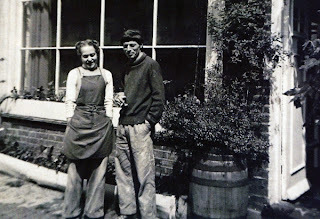 From 1860 to 1972 she taught part time at the Camberwell School of Art where she was known to be a bit rigorous and unsympathetic to her students — her demeanor somewhat steely, though pleasant. Always elegant, it was said that she stepped off her wheel after throwing as clean and spotless as when she went on. In 1981 she was advanced CBE and continued to exhibit and work throughout the decade, but after a series of strokes in the early 1990s she had to stop. In 1991 she was made Dame. She died in her home on April 1, 1995. Quietly spoken, she would politely show visitors around her studio and offer them strong coffee or tea and home-made chocolate cake . She possessed a clear understanding of her materials and control of form. She was one of the most creative studio potters of the twentieth century. 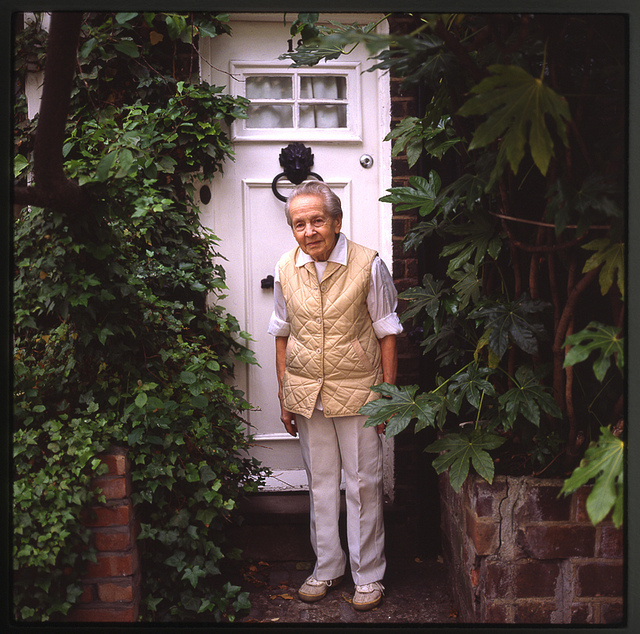 top image: Lucie Rie 1987 at her front door Jim Hair ; all other images with the exception of Phillips &de Pury from The Lucie Rie Archive at the Craft Studies Center.